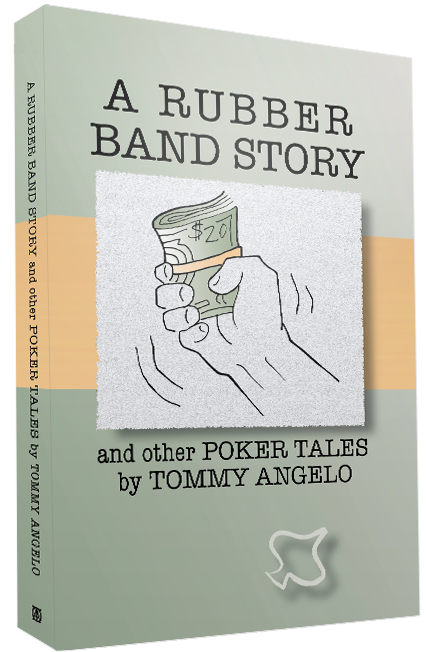 A Rubber Band Story and Other Poker Tales collects Tommy’s best articles, blogs, and stories from 2000 to 2010 and showcases them with eighteen new introductions and afterwords. Here you’ll find poker war stories from his years as a pro, poker fiction, ruminations on poker rules, and more – including a strong selection of articles on tilt, the author’s signature topic. The new commentaries, found only in this volume, take you behind the curtain on Angelo’s history and writing process. New readers will appreciate the humor and fresh perspective on poker, and existing fans will enjoy this convenient collection of Angelo’s most popular material. Print Buyers will receive the ebook for free. All print versions are autographed. Three hours later I had finished reading all fifty-five of Tommy Angelo’s stories. In short, they are fantastic. If you’re looking for either a tasty read or a source of poker wisdom, A RUBBER BAND STORY AND OTHER POKER TALES is a tome for you. You’ll come away with some laughs, some insights and a whole lot of new food for thought. If your only goal is to improve your poker results, read his Elements of Poker. If you want a little boost to your profits, but primarily want to spend an enjoyable, stimulating couple of hours, read this one TOO. Tommy has such a unique personality and writing style, he stands far out from other poker writers. I was amazed how much his stories related to my own experiences, even playing poker at a novice level. I was surprised how little I disliked this book, since I usually don’t care for stories about rubber bands, but (spoiler alert) despite the title, rubber bands play a very small role in this collection of poker lessons disguised as well-told stories. It’s traditional, before a speaker comes on stage, for someone else to say a few words. It’s also traditional for much of the audience to use that time to check their messages or tap their foot. If you already know about Tommy Angelo and why you want this book, go ahead and flip ahead to the main event. If you’re wondering what this book holds, tarry a little and I’ll give you a tour. Tommy Angelo is one of poker’s most highly regarded writers. He has fans. It’s not just the information – which is often fresh, useful, and from a perspective no one else has – it’s the delivery. There’s a sense of humor and a gift with words all too rare in poker literature. This book collects Tommy’s best short pieces from the last twelve years. Some he first wrote for magazines and some he told on his blog. They’re gathered together in groups, including a set called Musings, a large number of incidents that happened at a poker table, a collection of fiction, and an entire section of stories about Alex. So if you want to know who Alex is, turn right to page 49 for one of Tommy’s new introductions, and Tommy will tell you all about him. Or check out the last section if you most like hearing Tommy talk about tilt. After we gathered his best tales, Tommy started adding forewords and afterwords, and some of them started to grow. Some of them talk about his history or his writing process. Some of them reveal new insights on poker. There are about 18 new pieces here, ranging from a few lines to a couple pages each – all only available in this book. Like most stars, Tommy started humbly. He’s on record as saying poker first flirted with him when he was but a boy. Eventually, he began supporting himself by playing poker, and then progressed to coaching poker. As a coach, he quickly gained a reputation as the top choice for solving problems with tilt. World class players recommend him. Along the way, he invented a largesse of new poker terms, recorded an album of original poker songs, and folded AA before the flop (and told the world why). Tommy is one of a kind. For myself, I’ve enjoyed working with Tommy since 2005. That’s when I hired him as a poker coach. I filled out the Tiltless questionnaire in generous detail, and received a warm-hearted and ethical reply. Like most things that Tommy does, his first email to me was better than it had to be. Maybe it was the sense of humor or the lack of judgment, but eventually, when I’d studied my way through his Master Poker Outline half a dozen times, and the handful of typos was irritating the part of me that took the degree in English, I felt safe sending him, respectfully and with apologies for the presumption, a few corrections. To tell the truth, I expected a cool reaction. Most people think of editing as on a par with dental work. Some find it worse. Little did I know that Alex had already been editing Tommy for years, and Tommy had a taste for it. He said my edits were the best gift I could have given him, and offered to pay for more. That’s been working well for us ever since. Alex continued to mark Tommy’s pages with broad strokes while I filled in the details. It’s a bit as if Alex has a marker and I have a mechanical pencil. I feel extremely privileged to see Tommy’s writing early. First, there’s the ideas he comes up with. He consistently looks at poker from a different angle. It’s like that moment when you put on the 3-D glasses and elements you hadn’t even noticed pop out at you. Suddenly this game makes more sense. Then there’s Tommy’s way of writing. From an incident or a single attractive phrase, Tommy begins gathering related thoughts, bundles them together, passes them by me and Alex and sometimes several more early readers, rewrites, reorganizes, and polishes the words to a brilliant sheen. Along the way, I give input on structure and word choices, and see my thoughts appreciated, while I have the luxury of watching Tommy carve excellence from assorted raw materials in a remarkably stressfree fashion. Most of the writers I know would sell organs to revise their writing with that little angst. Finally, there are the words. Writers and editors develop a sensitive palate for words – and Tommy’s words are delicious. His sentences are simple and clean and casual – he might be talking just to you – and they are seasoned with humor and insight and the exotic spice of words he’s creating. It’s all just right. So let’s delay no longer. You in the second row, you can turn off your Blackberry. I promise what comes next will be worth your attention. Ladies and gentlemen, I am very pleased to present Tommy Angelo. I played poker for ten years before I discovered folding in 1984. That’s when I met Bobby. He had a big belly, a big beard, and a big laugh. Bobby was like Santa Claus, minus the giving. He just kept throwing his hand away, and he didn’t seem to mind. Then he would carry the money away, and the players didn’t seem to mind. So I started folding more often, to see what would happen. I folded before the flop with ten-nine a couple times. I folded queen-eight suited. I folded an ace when somebody raised. It was so new, so exciting. I was high from it, like an explorer. I kept adding more hands to not play, trying to get my starting-hand folding rate up with Bobby’s. But it didn’t stop there. Oh no. Before long I got hooked on the hard stuff, like folding on the river when I had a good hand. Soon I went to Vegas. After a week in the desert, I felt like Charles Darwin must have felt on the Galapagos Islands, having traveled to an isolated land, where he found strange new ecosystems populated by bizarre species. What I discovered on Las Vegas Island was that in the poker ecosystem, at the top of the food chain, sat the folders. I need to stop here and tell you exactly the kind of folding I mean. I’m talking about folding that is done often, and conspicuously, and audaciously, and without a fuss. Every now and then in the Vegas games, a non-folder would say something to a folder, sometimes friendly sometimes not, about playing so tight. I couldn’t get over how comfortable the folders were, with all of it, with the folding, with the comments, and they’d just sit there, behind their tall stacks and long smiles, and muck, one more time. I was like, okay, I see how this works now. It’s like a club. The folders club. Well, whatever it was, I wanted in. After my first taste of big-time folding, I felt that if I could get really good at it, I could quit my job. So I made folding my holy grail, my quest, my mountain to climb. I could see the mountain. I could see my path. I looked at the ground in front of me, and I took a step. By 1990 I was folding enough to support my food and rent habit. This freed up lots of time for lots more folding. Before long I got so good at folding that I could afford to get stupid at first one flavor of gambling then another and another. My tether line to solvency was always the folding. Anytime I was low on money, all I had to do was stop betting and stop eating and get back to the folding. Eventually I outpaced the gamble demon and the cigarette demon and the tilt demon and several others I met along the way. My path became a gentle incline that coaxed me up to a sunny ledge where I stopped, and sat, and I looked around in wonder, for I could see the top of the mountain far away and high above, and I could see the bottom, waiting for me, should I neglect my folding. When I play now, in 2006, one of the things I don’t do during the opening drive of the game is wager much. I like to get to the folding right away. My ideal session starts with a sip of coffee, then somebody raises and I fold from the big blind, then another little sip before I fold my small blind, then I take as big a sip as the coffee’s temperature will allow, and I sit up straight, and I get ready to play my button, and I exhale consciously, and most likely fold. Which brings me to the hand that got me to writing about my folding fetish in the first place. The game was live $80-160 limit hold’em. It was my first hand of the session. I was in the big blind with ace-ten offsuit and no hearts. One player limped, the small blind folded, and I checked. We were headsup going into the flop with me first. The flop came ace, ace, nine, with two hearts. The turn was the eight of hearts. The river was the seven of hearts, making the final board A-A-9, 8, 7, with four hearts. I checked. He bet. And I folded. Of course no one at the table had any idea I had a hand like that. After all, all that happened was limp, check – check, check – check, check – check, bet, fold. If any of my opponents were to draw a conclusion from what they had seen, it would not be that I had folded a good hand. It would be that I had chosen to not bluff, three times, with a bad one. And that’s why I fold the way I do, with a quiet mind and a silent body, so nobody knows what I had. Sometimes folding makes me feel like a puppet master. Like when I openraise from the cutoff with not much, and the button calls and the blinds fold, and it’s headsup with me first, and I miss the flop, and I check and he bets and I fold. Or if I raise before the flop and someone reraises behind me and everyone else is out and I call and the flop comes and I check and he bets and I fold. With punts like these, I make money twice. Once by immediately ending my worst situations. Twice by making it correct, in their worlds, for the bluffing types to bluff when I check, and for the folding types to fold when I bet. And all of a sudden, I can’t lose. I love folding. No one drives in San Francisco better than my buddy Alex. He does not hesitate. If there’s a gap, he shoots it. If there’s a jam up, he skirts it. And when it comes to parking, Alex is the self-proclaimed King. He plays it smart, like he does at poker, weighing the risks and rewards of each action, isolating variables and narrowing their values, and coming up with the best play. Here’s what you can expect if you go to a movie in San Francisco with Alex. You get in his car and drive two blocks and Alex swerves to the curb and slams to a stop in front of a hydrant, eight feet from a corner store. He’s back in seconds with a newspaper. You glance at the listings and agree on a movie. Trouble is, the movie starts in 15 minutes and the theater is 20 minutes away. But that’s okay because there’s 10 minutes of previews. The real problem – the thing that rates to make you late – is the parking. You know that, on average, it takes 20 minutes to find street parking that is, on average, a ten-minute walk from the theater. That’s half an hour. Far too long. Or you can pay $10 to park in a garage that is three blocks from the theater. That play buys you ten minutes for ten bucks. But it’s still hopeless. No way you can make it to the theater in time. The right play is to fold. “Let’s play some Scrabble and throw some Frisbee and go to a later showing,” you say. But it’s too late because you are already in Alex’s car and the thrusters are already engaged. Alex gears down for launch onto Oak Street, a four-lane heavily-populated-but-fast-moving one-way autoduct. Alex accelerates through a right-turn-on-red into a gap only three feet longer than his car. There’s a honk. Alex gestures. You put your seatbelt on. Seven blocks from the theater, you both start scanning the streets for parking. When you get to the garage, you know it’s long odds against finding a closer, quicker place to park, so you suggest splitting the cost with Alex – five bucks each – we can make it if we walk really fast, and can we just get out of the car now, please? Alex ignores you while he somehow wins a battle of nerves with a cable car. Then he makes a centripetally disorienting U-turn across five lanes on Van Ness. He reverse jerks against traffic for 10 lengths and slices into an illegal white-curb parking spot. The theater door is 30 feet away. You’ve got time for popcorn. Here’s where it gets confusing and beautiful. “This spot costs only $5,” Alex says, “half as much as the garage. Go ahead and give me the five bucks you were ready to pay for parking anyway, and you come out even.” He grins. Baffled into obedience, you give Alex a five-dollar bill. Popcorn procured, you take your seat, just as the movie starts, and a huge wave of contentment puts all thoughts of parking on hold. Next time at the poker table, you see that all of your betting decisions are just like parking in The City with Alex. There are variables. For each event, some variables have absolute values and some don’t. The cost of the parking ticket was an absolute. The duration of the parking was an absolute. The time saved was an absolute. But the chance of getting a ticket – an essential variable in the parking equation – who can say what that was? Only someone with experience and savvy at the parking game. Let’s say you’re on the river in a limit hold’em game and you have nothing and your opponent checks and you have to decide whether to bluff or not. The amount of money in the pot, that’s an absolute. The amount it costs to bluff, that’s an absolute. The likelihood that your opponent will fold? Knowing that is the secret to good parking. Go ask Alex. I think he’ll know. My mom used to tell me, “If it’s worth doing, it’s worth doing well.” This is such a profound and righteous philosophy. And I’ve stuck to it. For example, when I eat popcorn, I think it’s worth doing, so I do it well. With the fingertips of one hand, I can pick up a surprisingly large amount of popcorn and put all of it in my mouth, without dropping a single piece, in the dark. Another activity I give my best to is folding. I can fold poker hands at high velocity with crosshair precision and the cards vanish into the muck. And when it comes to tilting, well, I hate to brag, but I do believe that I might be the greatest tilter of all time. Yes, I know, that’s an unfalsifiable claim. Just because I happen to tower above everyone in my player pool as the unquestioned champion tilter doesn’t mean there isn’t some tilter I’ve never met who is better than me. All I can say is, bring him on! I’ll take on anyone anywhere anytime in a globally televised heads-up tilt-off if need be, to find out if I am indeed the world’s greatest. And because I am a generous man, I am now going to share with you some of my tilt wisdom, and yes, a few of my secrets. Let’s start with that well-worn question that has generated so many classic arguments: Is tilting a science or an art? My answer is: Yes. I believe that easy tilting is a science, and that difficult tilting is an art. By applying the scientific approach, one can manipulate the tilt-inducing variables, such as playing twenty hours in a row after hardly any sleep, to bring out one’s best tilt. But can you be unexplainably angry at everyone and hate yourself and your money when you are winning every pot? That’s something only a tilt artist can do. Oh yes, I most definitely can, in several ways. Try this. Reverse the order of cause and effect. One of the effects of tilt is that it makes us play bad, so to initiate tilt, make some really bad plays on purpose. Call when you should fold. Fold when you should call. The act of playing bad will agitate you, and that in itself will bring on some tilt. Here’s another simple way to backdoor some tilt. Start with one of the other main effects of tilt, namely, that it makes us unhappy. What you do is, wait until you are naturally unhappy—such as after a heated argument with your best friend—and then go play poker! I guarantee you this will increase your probability of tilting, and the tilt will then compound your unhappiness which will nourish your tilt even more. Give it a try. This is a lock. So far I’ve been talking to you on the level of How to Tilt 101. Now I’m going to share a concept about tilt that only the Grand Tiltmasters truly understand. When it comes to fixing your tiltlessness, you have to realize that there are band-aids, and there are cures. Everything so far has been band-aids. Some other excellent, effective band-aids you can use are to make sure that you don’t take breaks, and that your body is sleep-deprived and malnourished. As to cures, what you have to realize is that tiltlessness is what happens when you are in control of your mind. So, to become a master tilter, you must let your mind be your master. You must fill your mind with worry, and regret, and anxiety, and fear. When you are sitting contentedly playing poker, the problem is that you are living in the present. If only you could unshackle your mind from the bonds of reality. If only you could pry yourself away from what is. Then you would be liberated. Then your mind would be set free—free to drift into the past and dwell on your bad luck and your bad playing and your bad streaks—free to gallop into the future so that it can languish in the land of worry. Then, and only then, your mind would be empowered by imaginary madness to do that thing that it does so well—make you tilt. It is extremely difficult to willfully wrench yourself free from happiness while it is going on. Learning how to do it is a long, slow process. That’s why, if you’re really serious about curing your tiltlessness, you have to practice doing it away from the poker table. You probably never thought of the act of waiting for something as an opportunity to practice your poker. Well, it is. It’s one of the best. Think about it. Doesn’t poker involve a lot of waiting? When it comes to working on your tilting while you wait, it doesn’t matter what you are waiting for. You could be waiting in line, or waiting for a plane, or waiting for someone who is late. The only requirement is that you have empty time that you can’t speed up. Then she hands the ice cream to the cashier, and off he goes to the frozen food cooler. This is the key moment for you. Even though you know that it would be totally illogical and absurd to get upset right now because you have no control over the situation, it is absolutely imperative, for the purpose of curing your tiltlessness, that you do. For poker’s sake, you must summon the strength to be agitated at the woman, and at the cashier, and at the whole universe if need be. You must not remain calm. I know, it’s tough. I never said this was going to be easy. But I have faith you can do it. I believe anyone can. Eons later, the cashier comes back with a rock hard brick of ice cream, and even though the final total of her bill has been staring her in the face the entire time, the woman now pulls out her checkbook to start to write a check. Be strong! This is not the time for compassion! This is not the time to let the evil witch remind you of your adorably forgetful grandmother. Be angrily annoyed! Be frantically frustrated! Now is the time to dig deep into the depths of the darkest part of your soul and feel extreme bitterness toward this feeble stranger who you will never see again. Another great way to practice your poker tilt is to get mad at your opponents for doing things you do. Well here’s some good news. You don’t have to wait for your next poker game to do that. You can practice while driving. You can drive yourself to tilt! For example, let’s say you are in a crowded parking lot, looking for a place to park. You see someone getting in their car, so you stop and wait for them to pull out of their spot, and you pull in. It so happens that there was not enough room to drive around you while you lurked, and a line of cars backed up behind you. After you finish shopping, you get in your car and you back out of your parking spot and you aim for the exit. Just one problem. You aren’t moving. And the reason you aren’t moving, for like, forever, is that the guy in the car in front of you is stubbornly waiting for the slowest person in the universe to pull out of a parking space so that he can pull in. Waiting … what an A-hole … waiting … what a selfish, rude A-hole … waiting … waiting … aaarrrggGGHHH!! Good. That’s good. Well done. Once you get into the habit of refining the essential tilting skill of being able to get upset when total strangers do routine things that you do too, it’s possible to maintain a state of near-constant agitation when you are behind the wheel, interspersed with fits of rage. That combination is perfect tilting form at poker. Which is why driving is a bountiful opportunity to practice tilting. Okay. I’ve done my best. I have taught you everything you need to know to become a world-class tilter like me. You had better follow up on this. I don’t want to hear any stories about you being tranquil and concentrated and accumulating a fat bankroll. That would totally tilt me. And then you’d be responsible for what I say to that old woman at the store.